Two brand-new library buildings at Waiheke Island and Ranui are home to the usual things you'd expect to find in a modern library - books, magazines and DVDs for all ages, public-access computers and free wifi. But they are also home to unique and beautiful art works created especially for their people. Locals gather at dawn around the pou at Waiheke Library. The pou are named Tikapa (front), Putiki O Kahu (centre) and Piritahi (back). Opened in July 2014, the new Waiheke Library building features three works of permanent art that evoke the island’s distinct stories and character. Auckland Libraries' Pou Whakahaere, Service Innovation Māori, Anahera Sadler says two of the artworks were developed in partnership with Ngati Paoa, mana whenua, or traditional owners, of Waiheke Island. based on Taratara-ā-Kae, a crescent wave and whale motif. One of these artworks is called Waiheke Pou Whakara. Created under the direction of head carver Chris Bailey (Ngāti Paoa, Ngāti Hako,Te Aupouri, Ngāti Porou), the three pou whenua and a navigation stone command the knoll on the uppermost northern edge of the Artworks precinct in which the library sits at Oneroa. 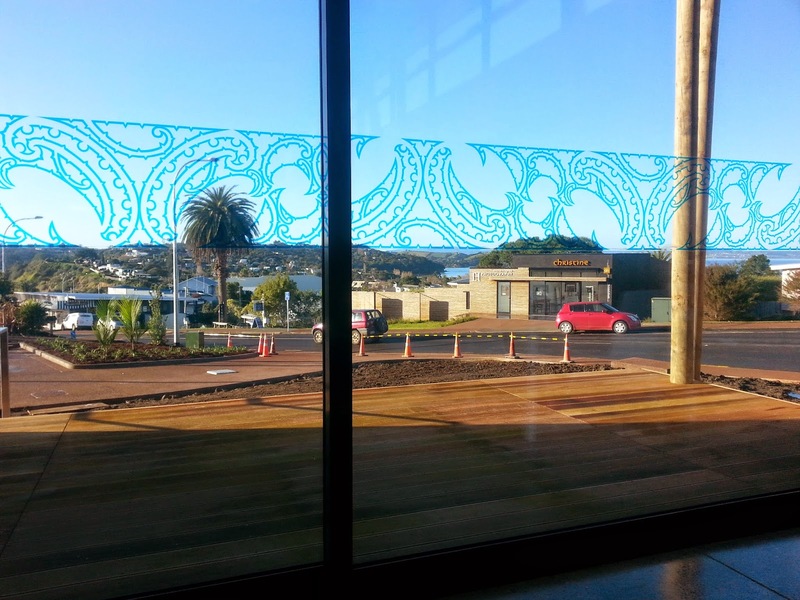 Also created in conjunction with Ngāti Paoa is the dynamic graphic print that wraps the library building's exterior and interior glass surfaces. Titled Ngaruhora by Lorna Dixon-Rikihana (Ngāti Paoa), it is based on Taratara-ā-Kae, a crescent wave and whale motif. The third artwork is part of the library itself. The phrase "Lots of rain, lots of sun, lots of wind, lots of day, lots of night" is embedded into the walls of the new library building and took artist Kazu Nakagawa six months to create. The piece is titled Forty Nine Letters and pays tribute to Waiheke's changeable weather, which Nakagawa, as a long-time resident of the island himself, is very familiar with. Meanwhile, etched into the building’s concrete floor with overlapping calligraphic script are the words 'whenua', 'land', 'hau' and 'wind' to form a lyrical pattern of repeating text. At the new Ranui Library, opened in October 2014, two beautiful artworks adorn the building's interior. The Great Forest by Nic Moon, featuring handprints of locals. The first is the striking floor-to-ceiling creation by Nic Moon. Situated in the heart of the library, "The Great Forest" incorporates hundreds of hand prints from community members who were invited to contribute to the artwork during a public open day. The piece transforms the library's living room into an immense mythological forest and surrounds a symbolic fire around which we may gather to draw warmth and inspiration. Hanging above the fire are rusted steel shovels incised with indigenous plant leaf patterns, which pay tribute to the spirit of the gardeners, farmers and orchardists from the area both past and present. The second artwork within Ranui Library is a series of kōwhaiwhai panels that wrap around the building's elevator shaft. Auckland Libraries worked in partnership with Te Kawerau a Maki, mana whenua of West Auckland to create this stunning work which graphically references several of Te Kawerau a Maki's most prominent ancestors. Mirla Edmundson, Auckland Libraries' Manager of Customer Experience Central City and Heritage, believes libraries and public art are a natural fit. "When the artist, architect and libraries work together creatively, we get more than a building," she says. "Good public art stimulates the imagination and enhances our public realm. Integrated art in buildings is a great alternative to a standalone work because it changes the way we experience what might be a requirement of a building, such as a sun screen to reduce solar gain or a handrail for a stairway or a screen to separate spaces. "Those elements can become beautiful, or invite us to think more deeply about our environment."